It didn’t take ESPN long to realize the UFC’s value in terms of aiding its company-wide streaming strategy. The Walt Disney Company, which owns ESPN, is all-in on streaming and is in the process of trying to build a competitor to Netflix. On the sports side, its streaming service is ESPN+, which for $4.99 or $49 a year gives subscribers content across a number of sports, but at this time it’s primarily boxing and mixed martial arts. On Monday, ESPN announced a two-year extension to its deal with the UFC that will now run through 2025. In addition, the arguably bigger news is that ESPN is taking over the distribution of the UFC pay-per-views. Disney chairman Bob Iger has repeatedly noted how important the streaming services are to the future of the company. In a Feb. 5 earnings call, he said its streaming services lost $136 million in the prior quarter. 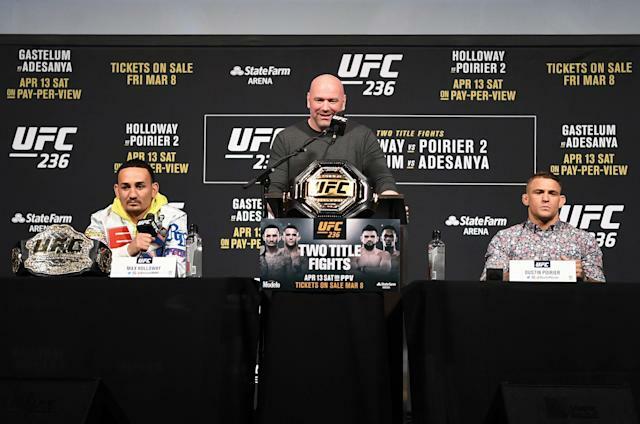 But he noted that on the launch of the UFC’s partnership with ESPN on Jan. 19, when flyweight champion Henry Cejudo successfully defended his belt by knocking out T.J. Dillashaw, ESPN+ added 568,000 subscribers in the two-day period leading up to that event. Roughly a quarter of the 2 million ESPN+ subscribers joined on that day. An ESPN spokeswoman said company policy is not to reveal information such as subscribers, and so she was unable to say how many more subscribers beyond the 568,000 that the company already acknowledged have signed up to ESPN+ as a result of its deal with the UFC. UFC president Dana White said he believes the deal will benefit all parties — ESPN, the UFC, UFC fighters and the public — and said the benefits have already been felt. He noted that “SportsCenter” did a nearly five-minute profile of UFC welterweight Darren Till last week and said it’s an example of why he believes it will be easier for the UFC to create stars than ever before. Stars are what make the engine run in combat sports. The UFC pay-per-view preliminaries will continue to be broadcast on ESPN. So during a typical UFC pay-per-view day, the early preliminaries will be streamed via ESPN+. Fans who want to see all the fights will then have to go to ESPN for four featured preliminaries, and then back to ESPN+ for the five pay-per-view bouts. The belief is that having the featured preliminaries on ESPN will help push buyers who are on the edge to make the pay-per-view purchase. ESPN essentially took the risk away from the UFC on its pay-per-view sales and paid the promotion for the exclusive right to sell its pay-per-views. The benefit for the UFC is obvious: It knows how much money it will make each year, and it can avoid a downmarket, and it will get data about its customers it has never had before. Much of the incentive on the UFC side is managing volatility in the PPV marketplace. When its stars such as Conor McGregor fight more often, the UFC’s numbers are bigger. UFC 229, which featured McGregor against Khabib Nurmagomedov in Las Vegas for the lightweight title, did more than 2.5 million. But UFC 224 on May 12, 2018, in Brazil that featured a women’s title fight between bantamweight champion Amanda Nunes and Raquel Pennington, did not hit 100,000 in sales. So in years in which the UFC stars aren’t as active and fight cards such as UFC 224 don’t do as well, the UFC won’t suffer financially. Conversely, if the big stars fight multiple times in a year, the UFC may make less than it might have previously. Fans thus will see little change other than that all pay-per-views will be streamed and not delivered over cable or satellite television. No longer will fans be able to buy the pay-per-view from their cable company or their satellite television provider. In order to purchase a UFC pay-per-view, one must be an ESPN+ subscriber. Those who are already ESPN+ subscribers will get a $5 discount for each pay-per-view, with the price dropping from $64.99 to $59.99. Fans who aren’t currently subscribers will pay $79.99, but that will buy them an ESPN+ membership as well as that first pay-per-view. After that, each pay-per-view would then be $59.99. Fans who don’t want ESPN+ will be out of luck, or will have to pay for something they don’t want or won’t use. Like Netflix, the pay-per-views will be available to watch on the web, through an ESPN app or via a connected device such as Apple TV, Chromecast, Roku, the Amazon Fire stick, Samsung Smart TVs, the Playstation 4 and more. White said the UFC will provide additional content for ESPN+ that it hasn’t been able to do in the past because Fox didn’t have a place for it during their seven-year partnership. He told Yahoo Sports the UFC’s reality series, “The Ultimate Fighter,” will return after its future had been in doubt. White said TUF is not part of the ESPN deal and said he is talking to another network about placing it on there.